In an accessible, inviting format, this forty-day devotional experience weaves inspirational readings on faith and prayer with quotes and excerpts from John Wesley. Each selection offers a simple daily pattern of reflection with a prayer, scripture, a short reading, quotes from John Wesley, and a blessing to take with you through the day. 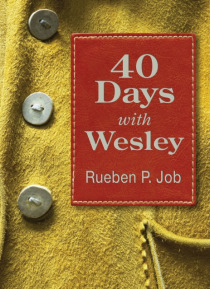 Even those new to Wesley or a daily prayer guide will find … this book an easy read for reassurance and inspiration during the Lent and Easter season. Those familiar with Rueben Job's writing will be delighted to find selections of his writing from the past two decades in a new format.Packaged in a flexible, soft-cover binding with a ribbon bookmark making it perfect for gifts.